When Peter Thum started Liberty United, he put an unusual product at the heart of the business: illegal guns. 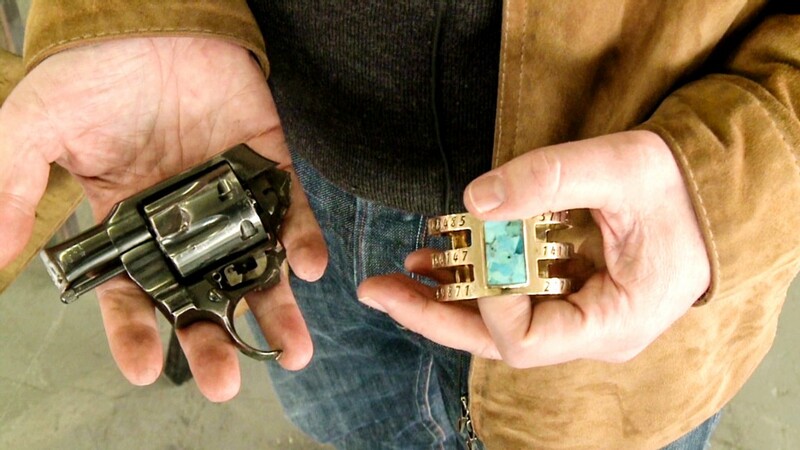 The New York-based startup, which Thum launched with his wife in June, has a specific mission: take guns and bullets off the street and turn them into beautiful pieces of jewelry. So far, the company has collected over 1,000 guns from law enforcement agencies in Philadelphia, Newburgh, N.Y., and Syracuse, N.Y. Thum said he picked those three cities because of their high rate of gun violence. Eventually, he hopes to partner with cities nationwide. In each of those cities, Liberty United also works closely with the mayor's office. "We've had a terrific relationship with the cities and their police departments right from the beginning," said Thum. Typically, after law enforcement agencies confiscate illegal weapons, they catalog and destroy them. Liberty United takes the guns after they've been cataloged and sends them to a blacksmith who disassembles and smelts them. Liberty United collects the scrap metal and artists use it to make the jewelry. Thum said a portion of the jewelry's sales help fund programs to reduce gun violence and to support its victims. It's an area Thum is very familiar with. In 2009, he started Fonderie 47, which collects AK 47 assault rifles from conflict zones in Africa and uses the metal to make jewelry and other accessories. Each sale helps fund the destruction of assault rifles in Africa, said Thum. He estimated that 34,000 weapons have been destroyed in Congo and Burundi as a result of Fonderie 47. For its first collection, Liberty United partnered with jewelry designer Philip Crangi, who created railroad spike-inspired rings, bracelets and necklaces priced between $85 and $1,400. Liberty United profits from these sales, but donates 25% to programs like the Mural Arts program in Philadelphia, which offers art education in local prisons and rehabilitation centers. The company will also donate a portion of the profits to similar programs in Syracuse and Newburgh. The recycled metal from the guns went to producing thousands of handmade pieces for the collection, which is still available online. Each piece has a serial number inscribed in it of a gun that Liberty United reclaimed. Liberty United is now collaborating with designer Pamela Love on a similarly priced collection that launched in November and includes necklaces and cuffs with semi-precious stones. Thum is well-versed in social entrepreneurship. In addition to Fonderie 47, he founded Ethos Water in 2002, which funds water and sanitation projects in developing countries. Three years later, he sold the company to Starbucks (SBUX) for $7.7 million. It was during business trips to Africa with Ethos that he first got the idea for Fonderie 47. "I would be stopped at roadblocks by 12-year-old boys armed with rifles," he said. "I realized then that we couldn't make meaningful progress with our other projects in Africa until we also did something about this." Gun violence, both in Africa's war zones and on the streets of America, is a problem that can't be ignored, he said. "We wanted to use what we had learned and achieved through Fonderie 47 to build an effort to reduce gun violence here at home," said Thum.